Since 1997, Steve has been a Chartered Meteorologist under the scheme administered by the Royal Meteorological Society (RMetS). He began his career with the UK Met Office, stationed at Stansted Airport, gaining experience in all aspects of aviation meteorology. He then completed BSc and PhD degrees at the University of East Anglia (UEA) in Norwich, during which time he developed particular interests in the way meteorology interfaces with Energy, Hydrology and Air Quality. After a Visiting Fellow position with Environment Canada in Toronto, Steve returned to UEA in Norwich in 1994 to take up a Faculty position in the School of Environmental Sciences, combining applied meteorological research with the teaching of undergraduate and masters meteorology courses; most years, Steve leads a week-long undergraduate micro-meteorology and micro-climate fieldcourse to Cumbria. 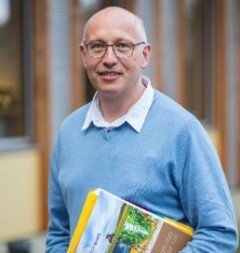 In recent years he has extended his meteorological research into the fields of Food-, Water- and Energy Security, the so-called Food-Water-Energy Nexus, and his research group is currently funded by the NERC, the European Union (Copernicus, H2020), Innovate-UK, Defra (EIP-Agri) and UEA. In 2015 Steve was a founding Director of the World Energy and Meteorology Council (WEMC). Steve has led the supervision of fourteen successful PhD projects and has served on the RMetS Council and NERC Peer Review Colleges. From 2014-17 Steve held the position of Associate Dean in the Faculty of Science at UEA and in 2017 he was promoted to the position of Professor of Meteorology. In 2001 Steve was a co-founding Director of Weatherquest. Today his role within the company is to be an Account Manager for many clients and to lead on R&D Innovations and the launch of related new services. Steve also facilitates work placement opportunities for students at Weatherquest, especially those studying at UEA and others who wish to come to the UK under EU-supported schemes. Steve is co-author of the textbook Operational Weather Forecasting, published by Wiley in 2013.